How to Apply for Vijaya Bank POs Probationary Assistant Managers Recruitment 2018: Vijaya Bank PO Recruitment 2018: Apply online on vijayabank.com for 330 vacancies, check important dates here. 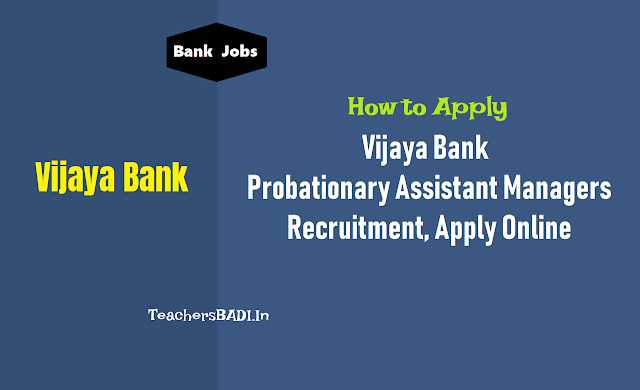 Vijaya Bank has released 330 applications for Probationary Assistant Manager in General Manager stream. Interested candidates may apply online till September 29, 2018 on vijaybank.com. An application fee of Rs.100 would be applicable for SC/ST/PWD category students and Rs. 600 for General category students. Check important dates, eligibility criteria and direct link to apply below. Direct link to apply for Vijaya Bank Recruitment 2018. An online exam would be conducted, followed by an interview. The questions in online exam would be related to general awareness with special reference to Banking Industry, English language and finance management. For every wrong answer, 0.25 marks would be deducted. Selected candidates would undergo training for three months through an institute selected by the bank. During the course, candidates would be paid a stipend of Rs. 15,000 p.m. At the end of the course an exit test would be conducted. Only those candidates who pass the exit test by scoring the cut off marks as decided by the bank would be offered appointemnt in the bank. Candidates must fall in the age bracket of 21 to 30 years with a graduation degree in any discipline with a minimum of 60 percent of marks. Candidate must own a degree in either of these courses- Chartered Accountant, ICWA, Company Secretary, MBA/ PGDBM /PGDM /PGBM /PGDBA. Candidates may read further details on the official notification provided here. i) Have a valid personal email ID, which should be kept alive for entire duration of the recruitment project. In case a candidate does not have a valid personal email ID, he/she should create his/her new email ID before applying online and must maintain that email account. Third party email ID is not permitted. ii) Keep the necessary details of educational qualification and other personal details ready for entering in the online application. iii) Scan his/her photograph and signature ensuring that both conform to the notification available on Bank’s website. iv) Candidates are advised in their own interest not to share with/mention to any other person, their login/user credentials generated specifically for this recruitment project.